This leather executive chair from Comfort Seating is made with polyfoam cushions over a compression molded wooden frame. The base and armrests are injection molded plastic in an attractive champagne color. And the chair is upholstered in black leather with vinyl match. 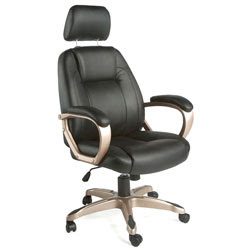 This executive chair features an adjustable headrest to conform to user's height, perforated leather zones that provide enchanced breathability and air flow, and padded armrests. Ergonomic features include instant lift seat height adjustment, tilt tension control, and tilt lock. Comfort Seating, established in 2007, have been offering quality value for money design and manufacturers of quality, style-driven furniture for restaurants, nightclubs, bars and hotels. They specialize in contemporary contract furniture ideally suited as restaurant furniture, bar furniture, hotel furniture and cafe. They also supply pub furniture, conference furniture and golf club furniture. Comfort Seating work closely with architects and designers, assisting in the development of effective solutions, from initial brief to full installation. Comfort Seating offers great design, value for money, durability but overall quality. They have a team of furniture designers who liaise closely with the customer, architects or interior designers to ensure the right product is produced for the right interior space. Comfort seating provides the ultimate in choice and quality, at fantastic prices. All products are manufactured and upholstered in their factory from a raw product to a high standard of finish.